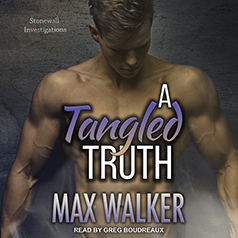 Max Walker presents the third book in his Stonewall Investigations series. Contains mature themes. Liam Wolfe isn't having the best of days. He's being falsely accused of things he'd never even think of doing and is now facing the loss of his career because of it. He has an idea of who's behind the attempt at assassinating his character but can't put the pieces together by himself. Mark Masters isn't having any better of a time. He's sitting in his office at Stonewall Investigations, getting work done, when his boyfriend of a year walks in with the sole goal of breaking up with him. He's blindsided by the development and thinks not much else can surprise him. Moments after the breakup, Liam walks into Mark's office looking for help and a connection that had been lost for years suddenly reignites. As childhood best friends, Mark and Liam were inseparable. As adults, they'll come to learn not much has changed. With a second chance on the horizon, Mark and Liam explore something that fear had cut them off from as kids. They'll do it while working together to unravel the truth behind Liam's case, risking everything they've regained in the process.